Mickaël and I are slowly returning to reality after a magical weekend for which I am so very grateful. I will be back as soon as my feet touch the ground to share my joy with you. In the meantime thank you so much for your warm birthday wishes and eager response to my little gift offer. Mademoiselle Dotty Poppy (my latest customer order) has an announcement to make! Who will win Eowyn Ivey's The Snow Child? Melissa, please send me your postal address so that you may enjoy this book during the sparkling days of Advent! Let's share the excitement of reading it together. I wish you all a very, very happy new week. Generally speaking November does not get a good press. I don't know about you but I would like to relinquish all notions of a four-quartered year. The ragged interface, for example, between autumn and winter, which could be considered a short, hybrid season in itself, usually occurs in November, I think. Rotting leaves turn into a fragrant mulch. Birds still berry in the woods. The damp air is full of distinct noises; dripping branches and seedpods like tiny rattles on the trees. The air here in France is cold without being chill. We no longer fight the urge to close the shutters tight come early evening. We become homebodies mostly. And then the first, magical frost comes. "There's nothing like a touch of frost to add glamour to the winter garden. Like hard white icing on a dark fruit cake, it transforms the stuff of everyday life into something special - a birthday or a christening instead of the usual Saturday teatime in front of the telly." Katherine Swift, The Morville Year (p. 244). I love frost! Don't you? And I thank Katherine Swift for raising it the thrilling heights of birthday celebrations for I realise now that, undeniable aesthetic values aside, for decades I must have associated the first frosts with my November birthday. Yes indeed I will be celebrating gaining another year this week. On the day itself I will be eating out with a precious friend at our favourite local haunt, La Part Belle and for the first time ever in our nine years of wedded bliss (hee, hee!) MIckaël is taking me away for the weekend to a surprise destination whilst his parents sweetly come and look after our children. I am as excited as can be! Aside from making 'Eve's Pudding', using my favourite fragrant Blechard apples with a touch of lemon zest, or ''Chocolate Puddle Pudding' served when the children are home from school with a little cream or vanilla ice cream I had to channel my excitement into something more creative and less calorific! Here is Mademoiselle Ciel d'Hiver (Winter Sky), an enchanted hare, who represents the most magic of all natural beauty; the unique snowflake, the silvery and intricate calligraphy of Jack Frost (I loved him as a child), the glaze of ice on water, a deep winter sleep, and in particular the winter sky. When I first arrived in France fifteen years ago I settled down in a little fishing village on the Normandy coastline and would follow the country road to get to the nearest town, Bayeux. My first winter left me breathless with excitement. I would slow my car down and gasp at the mist swirling over the frosty pastures and the sky pink, grey, and mauve, with occasional flashes of orange as the sun lazily woke up. It was so beautiful. Mademoiselle Ciel d'Hiver loves to gaze at the winter landscape suffused with pink light. She will clap her hands with pleasure when the first frost or snowfall occur. In the long evenings when the curtains are drawn she will be supremely content sitting in an armchair with the candles lit and reading a good book such as "The Secret Garden". She is very feminine and quietly spoken and very fond of white icing sugar and silver balls on cakes. Ivory silk (from Angélique's christening gown) line her ears. Silvery embroidered snowflakes cover her slender feet and long ears. Translucent glass beads have been knitted into her little tunic which, to my mind, contains all the colours of the winter sky I first found in France by the sea all those years ago. And, best of all, a beautiful ivory lace, HANDMADE by a specialist lacemaker, trims the trousers. It's intricate, regular pattern reminds me of Jack Frost's delicate designs on icy windowpanes and the effect of frosty parterre designs in Baroque and Renaissance gardens. It's the same as the one I used for Mademoiselle Autumn Serenade (hi Claire!). This little hare appeared in my Etsy shop yesterday and disappeared again, as if by magic, not once but twice (oops). In short I have made her, partly, to celebrate my fast approaching birthday, and my favourite books, which I always dip into with every first frost; Marina Warner's book "The Skating Party", and my favourite part of Virginia Woolf's "Orlando" which describes the Great Freeze in London in the sixteenth century. Do you see the book on the right? A few days ago Lori, in an inspiring post in which she reveals the most stunning reindeer shawl she knitted herself on her return from adventures in Alaska, eagerly shared her opinion of Eowyn Ivey's The Snow Child. She wrote; 'the snow child is about homesteading in alaska in the 1920's. magical, delicate, poignant, a beautiful story. and the art work on the cover, LOVE that too'. It did not take me long to order two copies of this book. One of these I would like to gift to you. My copy is patiently sitting on my (dusty) bedside table. I longingly brush a finger over its beautiful cover every night when I creep into bed well past midnight. I have many hares to stitch for Christmas, you see, and little time to read. I love the idea, however, of sending this book out to someone special and reading it together; simultaneously. Another small connection in this vast world we live in. So, dear readers, this is my small birthday present to you. If you are interested in reading The Snow Child simply leave me a comment. I would be most grateful if you could become a follower too, although it is by no means essential. (Of course if you care to 'like' my facebook page, Madame Millefeuilles, I would be equally thankful.) I will announce the winner in a week's time. 'Til then, I wish you all a beautiful week and thank you so much for taking the time to visit. Sixteen of us, spanning four generations, gathered to celebrate my father's ninetieth birthday last Saturday in Tunbridge Wells. There was much laughter, fabulous champagne, and a few tears of pride too. We all savoured every hour of that special, intense, day together and revelled in our shared pride of this wonderful man who almost lost his life in Brac, Yugoslavia on June 6th 1944 (D-day in Normandy). A week on, the excitement having died down, I look back on last Saturday and feel compelled to celebrate quietly our good fortune. One of my favourite moments was, once the small children were in bed, sipping a glass of 1934 Port, poured by my father in his book-lined study, and chatting warmly together. My parents, four siblings, three husbands, and a few of my sisters' eldest children all discussing freely in English and French as we have done for decades. We recalled with wonder the speech made by my twenty-one year old nephew and marvelled at how well our children had demonstrated their love for their grand-father. This picture, taken by Tristan, shows the place cards he created with Héloïse for this special birthday party. Mushrooms, delicate leaves, intricate trees, and hearts, all cut out from handmade paper, represent their love for their grand-father. You can find my Ravery notes here. It has suddenly dawned upon me that I need to knit two more sweaters before the end of the year to successfully complete the 12 Sweaters In 2012 Ravelry Challenge. Um, alright then. Now, just look at this adorable little lady dangling in the tree! 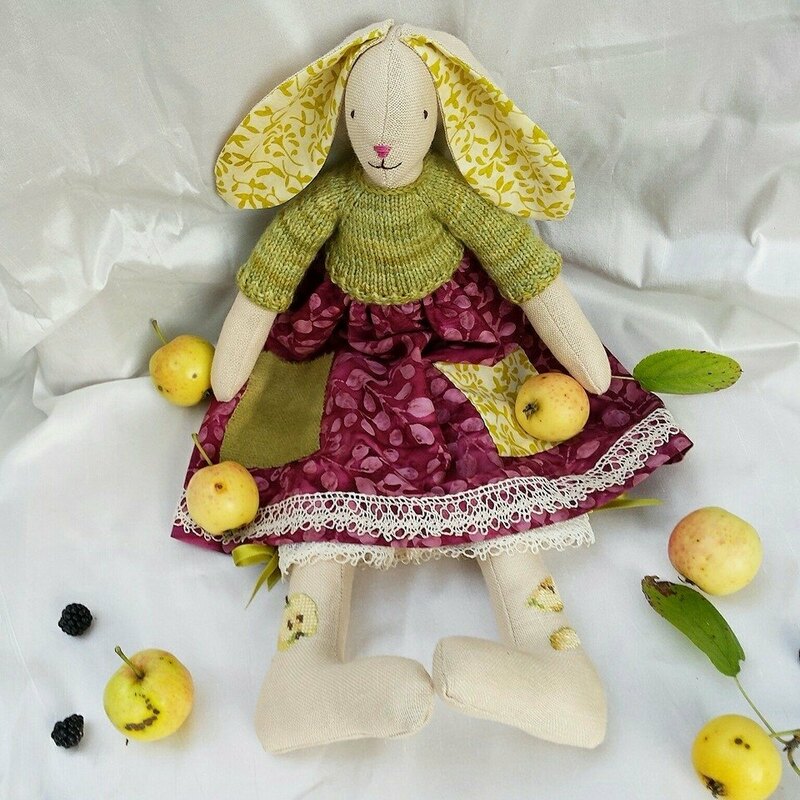 Her name is Miss Autumn and she is the creation of lovely, lovely Vivienne from Green Rabbit Designs. I am certain that you all know Vivienne. I really wish I could meet her some day. The next best thing was owning one of her rabbits. Of course, Angélique is the rightful owner and I must say Miss Autumn never leaves her side. She was the only toy to accompany her on our travels to England and, as you can see, this beautiful rabbit had some fun too! (Can some kind soul please tell me what this beautiful tree is, please?) One of the pleasures of Vivienne's rabbits is their size and weight. They are a joy to hold and sit perfectly in little hands. If you are tempted I think a Christmas rabbit is in the making but keep your eye open for the last one, Miss Holly, was snapped up very quickly indeed. Now I have a little whiskered-somebody to show you. Please do not all crowd around her for she is very timid indeed (despite the fact she is showing a bit of leg). Her name is Mademoiselle Poppy and she has been made for a lady who wishes to commemorate her mother whose name was Poppy, of course. She has requested an heirloom to pass on to her children who loved their grandmother dearly. What a lovely commission this has been for me, don't you agree? She is my first mouse and hopefully not my last. What do you think of her? Judging from appearances this mouse has a very sweet tooth! I feel she has one foot in the summer meadows but is looking ahead to Christmas. She has translucent sequins on her antique lace-trimmed pantaloons and pearly whiskers. Of course the red, white, and green remind me of the Festive Season too. I am fully aware of the seeming lack of respect of revealing a poppy-clad mouse on Armistice Day. I have mulled over this for hours and I hope you will forgive me for I have promised Mademoiselle Poppy's future owner to reveal her today. I'm very sorry. I really ought to stop rabbiting on and let you get on with something more important! Thank you all so much for stopping by. Your kindness and thoughtful comments make me smile from ear to ear. I hope you are all well and I wish you a happy week full of peace and hope.